This is a rare variety from Switzerland. 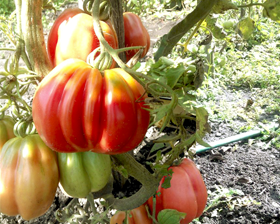 Long fluted pink tomatoes that are prized by chefs for their beautiful plate display. They are worth growing for their beauty alone. Height up to 1.2m, weight: up to 200g each tomato.